Photo: Tulsa,Oklahoma, The menagerie with animals in cages by Infinite Photographs at Animal Backgrounds. Hurry! Limited time offer. Offer valid only while supplies last. 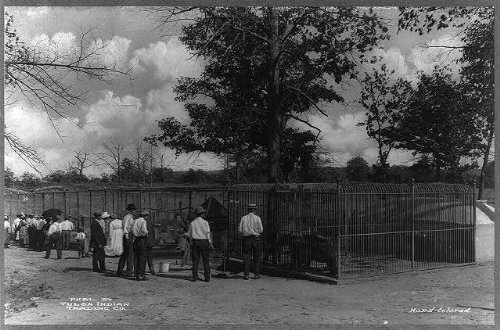 Photograph Description: Oklahoma - Tulsa - The menagerie with animals in cages Summary: 2 bears in foregrd. Notes: No. 1291. Wittemann Collection. Photograph Description: Oklahoma - Tulsa - The menagerie with animals in cages Summary: 2 bears in foregrd. Notes: No. 1291. Wittemann Collection. Caption card tracings: Zoological Gardens Oklahoma Tulsa; Oklahoma Tulsa; Geogr. ; Shelf.